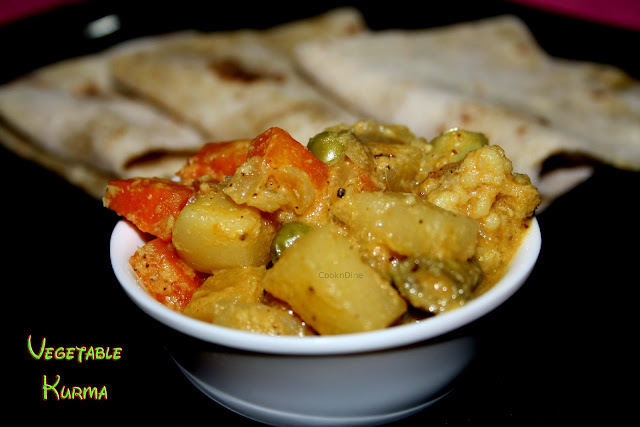 CooknDine....: Vegetable Kurma-Saravana Bhavan Style.. Living in a non-metro town is always an advantage in all aspects..Though we got many chances to shift to a metro city both me and my hubby were fasinated by the non-metro life....Starting right from mettur to Tuticorin I loved the place where we lived.. I had earlier posted in my Kara chutney post about the Saravana Bhavan opened in Punnai Nagar,a place near Tuticorin..I had told u that I got the recipe from the chef who is working there.Similarly last month we visited Thiruchendur and had our dinner at Saravana Bhavan,Punnai nagar (The native place of the owner of Saravana Bhavan)....My daughter usually orders South Indian Parotta..which is accompanied by 2 types of kurma..The kurma was so tempting and was also tasty..Luckily on that day again I peeped into the kitchen (There was no one except our family there! !It was a week day!! )to give a word of appreciation of a dish...and silently asked about the grinded masala..He just gave a quick ingredients list...I grasped it and tried it the next week...My mom had it for roti and with a big smile she told it matched with the taste of the hotel..I was so happy that day.. 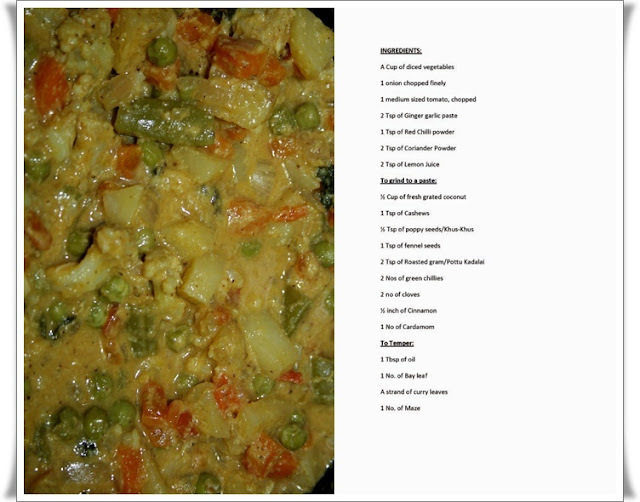 I thought i should share it with the blog readers so that you can make n relish the kurma of the restaurant style..
For the recipe please press READ MORE below..
Half Cook the vegetables.I had taken carrot,potato,cauliflower,green Peas,Beans all put together 1/2 a cup.U can drain the water and use the water finally for the kurma.. In a heavy bottomed pan add oil and heat it.Then add items mentioned in to temper list.Then add chopped onions,mint leaves and saute it.Then add ginger garlic paste and saute it nicely. Then add chopped tomatoes and saute it. To it add the grinded masala(coconut and other ingredients mixture) and saute well. Add the par boiled/half cooked vegetables,water(can use the one which we used to par boil the vegetables),salt and cook in low flame for 5 minutes. Adjust the water level according to the consistency u need. We loved it to be thick and so I added little water . U can skip the addition of turmeric powder too if u want a light colour to the kurma. 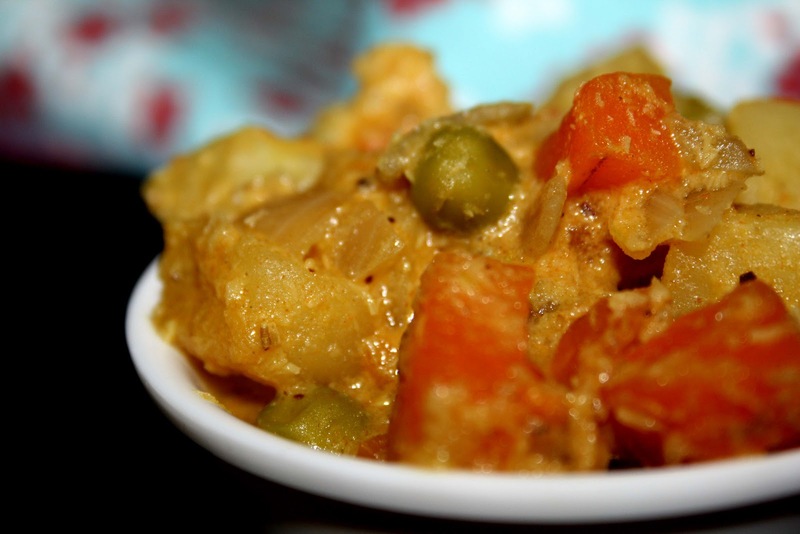 Vegetables like carrot,beans,potato,green peas,turnip,cauliflower,fresh soya beans,fresh butter beans can be added. Tk u chammu for trying it out and letting me know it! Your recipe is truly wonderful. ...It came out really well....n all of my family thoroughly loved it..Tysm !! Just wanted to let yuou know that I tried this today, along with some tips given by my friend in Viridhunagar. It was amazing. Please check my blog www.anubhavati.wordpress.com, when you can.